First of all, apologies for the delay on the 14xx/48xx Autocoach release. It is still "in a queue" and although I was hoping it would be released yesterday it didn't happen. I really appreciate your patience on this and thank you all for the excitement and encouragement you continue to show. I'll continue to push for it's release as soon as possible. In the meantime, here is the first picture of Work In Progress for the GWR small prairies pack/s. This is the 4575 variant of the GWR prairie with the larger side tanks. The packs will also include the 4500 with smaller tanks, and the original 4400 which had smaller driving wheels, all with numerous variations that they had including: curved and square frames, smokebox pipes, coal bunker guard, etc. Liveries planned are GWR green with all logos, BR black and BR lined green. 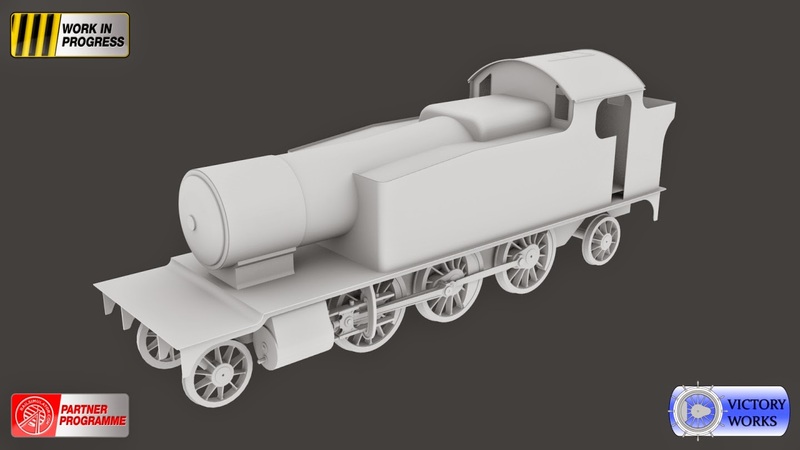 The BR 4575's and preserved GWR 4575's will be have the option to be autofitted (which will be compatible with the 14xx/48xx autocoaches - when they come out!) and there may be a bonus livery as well. Accompanying stock will be a brand new selection of GWR freight stock and possibly a BR diagram Autocoach. All the features you have come to expect from Victory Works will be included - steam chest simulation, accurate wheel slip, realistic controls and operation, 3D firebox, numerous optional parts selected per loco, etc. I'm also delighted to announce that the sounds for the locos will be provided by Steam Sounds Supreme who have a history of excellent work in this area. In light of the quantity it is likely to release in 2 packs. I'm not sure how it will be split as yet but I hope that the 2 packs will cover every variant and style that you could ever want. More details and progress images to follow soon. And the release date for the 14xx/48xx the very second that I know it!